Talis Select S and Talis Select E. Form and function come together, the lever completely disappears, and your customers can control their faucets at the touch of a button. Not only does this offer the ultimate in convenience, it also helps save water: The intuitive operation encourages users to turn the water off. The completely new design concept will help you tap into additional customer groups. For those who like the characteristic pin handles: The standard versions are still included in the collection – some in the new design. Talis S single-hole lavatory faucets can be operated comfortably with the pin handle, while the versions with handles on the side are less susceptible to soiling and can be cleaned optimally. Also available as a three-hole lavatory faucet or for wall mounting. Three-hole and four-hole versions, concealed versions and a free-standing faucet are available for the bathtub. For the shower: Surface-mounted and concealed single-hole faucets. Select technology on the Talis Select S makes your day-to-day bathroom routine easier with this new generation of products. New design: Talis E single-hole faucets for the vanity (80 / 110 / 240) offer optimal comfort combined with a precise, natural design. Also available as a three-hole faucet or for wall mounting. Three-hole and four-hole faucets and concealed solutions are available for the bathtub. In the shower, there are surface-mounted and concealed shower faucets. Talis Select E faucets can be operated with fingers, arms or elbows: the Select button transforms them into real marvels in terms of comfort. Here too, the different heights (110 / 240) create a lot of space between the spout and basin. Modern highlights at the bathtub and shower: The Talis collection includes single-hole faucets for surface-mounted and concealed installation. Slender, functional and good value: Talis S for the vanity, bathtub, shower and bidet will be a hit for many of your customers. A range of single-hole faucets are available for the vanity, with faucets for surface-mounted and concealed installation available for the bathtub and shower. 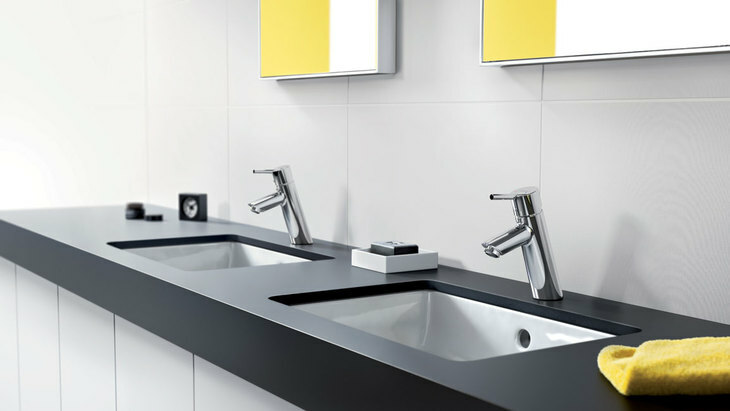 These exclusive bathroom faucets at affordable prices are a prime example of minimalist design, with the pin handle and high-quality faucet technology.